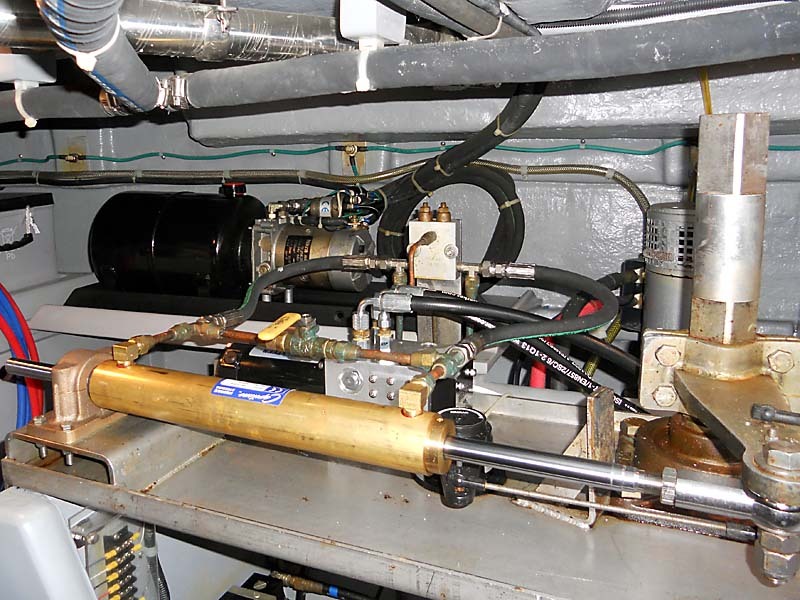 Hydraulics are used in various applications on boats and other equipment. Over the years I have used and applied hydraulic rams to many different purposes. Compressed air systems I basically categorize in the same group as the concept of operation is the same but the applications are different. From steering systems to ballast systems for racing yachts to fuel lines and shore based equipment for hauling vessels motors and articulated equipment like bulldozers. Hydraulic furling systems through Selden Masts are are one of the systems I know. Having had an agency for Selden I have installed many different systems for the. Normally this work is done in conjunction with the boat yard or the the sail company. The motors some time wear out and the seals need replacing from time to time. I have not done much in the way of repairs to hydraulic winches as they are still relatively new on the market. I expect in five years we will see more of the systems breaking down. One of the problems that do face the industry is the placement of the motors and the reservoirs. These systems take a lot of abuse. Salt, Sand, Permanent moisture. Then you have the electrolysis from the motor and the marina. Seals, metal fatigue and owner who keep the wheel turned hard all the way for extended periods of time . Locating the reservoirs and the motors is the first part of designing your system. Checking the reservoir level and then draining the fluid is a normal maintenance action. This pic shows a nice simple clean install of and older system i refurbished and re installed correctly. When overhauling a system always check the whole system as the bushings on the quadrant were worn which lead to the play in the ram which in turn damaged the seals. The owner loved the new location for the reservoir as he could now fill, drain and view the level. Selden systems I believe are manufactured by a third party. However the designs are good and I have not had any problems with the install I have done. The manual over-ride feature I like and over-all they are a well thought out system that enables you to add new products at will. Harken is Harken, well designed, well made and easy to install. I have never had a good relationship with Harken. So, I stuck with Selden. Harken only ever want to talk to you if you are dropping 10 k or more. And when you do you need to drop a name or two while you are at it. Not my kind of business. If you want a Harken system I will install it and it will work just fine. If you have an issue please don't call me to repair as they wont call back timeously, or not in the time frame most of my clients require. Which is why I have stuck with Selden. Nice people to work with. I was earning the princely sum of 2,500 dollars a month at the time and was some what incensed at the gesture.